May 30, 2006: Is Fructose the Problem? I was down at Safeway earlier today, and I was reading labels on sodas and bottled teas. It's no secret that they are loaded with sugar, and almost all of that sugar is in the form of high-fructose corn syrup (HFCS). I'm seeing more and more recognition that the introduction of high-fructose corn syrup in the early 1980s corresponds very closely with the beginning of the American obesity epidemic. This article provides a good summary. So what's really going on? Is there something biologically evil about corn syrup? As one source in the article suggests, the operative problem with HFCS may simply be that it's just so cheap that it's everywhere in huge quantities. However, some research also suggests that the problem with HCFS may not be its origin in corn, but in the nature of fructose itself. This article suggests that there are all kinds of weird little downsides to consuming sugar as fructose rather than sucrose or lactose. Our high-stress lives may also contribute: The stress hormone cortisol causes the liver to release glucose whether it's needed or not, which controbutes to insulin fatique and makes us needlessly hungry. Yes, I know, I've been on this box for a number of years, but it's important. A fat calorie is not metabolized the same way a sugar calorie is. We may well be eating too much of everything, but it's becoming clearer all the time that the part of "everything" that really seems to be killing us is sugar. I may eventually build a little Delphi app to go up and probe Amazon every hour to bring down book rankings, but I went looking for ready-made solutions last week, and found Titlez. It's a Web-based solution, something like JungleScan, which has not allowed me to enter new books for a long time and is currently down completely. For the moment the service is free, but it sounds like they intend to charge for it once it matures. It's...ok. I doubt I would pay for it, since all the basic information is available through Amazon's APIs, or right from their Web pages if you'd just prefer to parse a block of HTML and look for the rankings. And the data displays are not especially versatile, though it's still early and the thing is shot full of bugs. I've scraped a GIF of some of my own books and you can see it here. Interestingly, my assembly book was already being tracked, but my email book and SF novel were not. I was able to enter them, but only have data on the graphs for the last several days. This actually isn't entirely a bad thing: Because there's no way to specify the time period over which the data is displayed, the two short graphs actually tell a clearer story than the one long one, which is so condensed as to be virtually useless. It'll be interesting to see when (or whether) Titlez grows up into something that publishers and/or authors might be willing to pay for. (Furiously busy here, so entries may be shorter and perhaps sparser than they usually are.) I picked up a nice little screen saver program that doubles as a simple slide show presenter: Screen Paver. It's technically a screen saver, and you can set the program's parameters through Control Panel's Display applet, as with any screen saver. But if you set the time interval between images to 0, then it waits for a mouse click to change images. From the Display applet, you enter several different directories containing images, and Screen Paver will pull images randomly from all entered directories and display them at the specified interval. It will also play MP3s pulled randomly from a directory if you want music during your dead-times. One reason I like Screen Paver is that you can individually select among 32 different transition effects. I find some of the available transitions annoying, but each one has a check box, and you can un-check whatever transitions you don't want. Small, works as advertised, and precisely what I needed, right when I needed it. $12.95. Highly recommended. I recap my ongoing battle with spam here from time to time, so here's another report: I had to blackhole Geocities. If you send me email with a Geocities site URL in it, those messages will go right to my spam bucket. More on this in a moment. I changed overall antispam strategies radically several months ago: I abandoned POPFile completely; it crashed too often, and couldn't keep its false positive rate to zero. I now use the Bayesian filter built into PocoMail. It's much more conservative than POPFile, and I get zero false positives from it. Of course, that means it lets a certain amount of spam through too. I've kept my blocked senders list current, and have managed to block a certain amount of spam with forged sender addresses by looking for strings like ".com/un.php" and similar. Addresses like this one (which I altered from one that arrived yesterday so it isn't valid) point to minimal HTML pages that contain only a referrer address in a refresh header. Click the Geocities URL that you get in a spam message, and the Geocities page instantly transfers you to a conventional spammer Website URL somewhere else. They do this so that we can't filter on spammer payload domains. No matter. I've blackholed "geocities.com" for the time being. I suspect that some spammer somewhere automated the Geocities referrer site creation process, accounting for the huge runup in these messages, all of which came in through botnets. If all Geocities servers eventually require the solving of good captchas to create a site, this problem may go away, and I'll let the Geocities name out of jail. However, on one day last week when I counted, 27% of all my spam contained Geocities referrer URLs. I had to do something. 15% -20% of the spam that comes in still gets through my filters. The really big problem I have right now is with stock pump-and-dump schemes, where the entire text of the message is in a .gif or .jpg bitmap. These messages don't have a payload other than the message; there's no Web site to go to, except (for the true dimbulbs out there) to your broker's. Too many people send me messages with background graphics in .gif form, so I can't just nuke any message that comes in carrying a GIF. Nor are recent stock-scam messages otherwise empty. Spammers are now adding the conventional nonsense text to the messages, usually disguised in such a way as to make it minimally visible in a rendering window. I wonder sometimes what might make botnet control more difficult. Most zombies listen for commands on IRC; if ISPs blocked IRC (like many now block SMTP port 25) would subscribers revolt? Perhaps the secret is to add a feature to ISP servers where opening the IRC ports required solving a captcha for every connection. Something as simple as an ISP notification email to subscribers telling them that something on their machine is using IRC protocols might alert a few people to the presence of zombie software on their PCs. Anything that makes the botnet business more difficult would be a good thing. I use IRC only rarely (and then only for the #oldcatholic chat room) and I wouldn't mind solving a captcha to open an IRC port if it made a dent in botnet activity. I know, I know, the battle will never end, but that doesn't mean we all ought to give up the fight! The May 2006 issue of the alternative health magazine Townsend Letter carried an article (not online) by Joseph G. Hatterlsey concerning the role of vitamin B12 deficiency in the development of various dementias, including Alzheimer's Disease. Vitamin B12 deficiency runs in my family, and although I have no proof, I suspect it may have been a contributing factor in my mother's wasting death from an uncommon dementia (not AD, according to her physician) in 2000. I discovered sublingual Vitamin B12 a few years ago (see my entry for March 1, 2003) and have used it periodically when I feel a little dragged out. I think I may begin using it daily or at very least, weekly. The Townsend Letter article started me researching, and while relatively recent, the dementia connection is not crackpot stuff. Mild B12 deficiency can cause mild depression and sleep disorders, both of which I've struggled with since I've turned 50. My mother, in the years immediately prior to her death, suffered from severe depression and severe insomnia, which we always assumed were purely psychiatric disorders stemming from her bizarre Manichaean Roman Catholic faith and my father's long struggle with cancer. Now I'm wondering if she were B12 deficient as well, and kicking myself that we never suggested B12 injections, which are cheap and without significant side effects. (One occasional side effect is aggravation of acne, which I doubt would have been an issue in a 76-year-old woman.) The literature I've read doesn't imply that AD is caused by vitamin B12 deficiency, but that insufficient levels of B12 can aggravate AD symptoms and accelerate the progress of the disease. Bringing serum B12 levels back to normal can ameliorate AD symptoms, and slow the disease's progress. I live by my brain (pace Woody Allen, I consider it my first favorite organ) and if a cheap and safe daily squirt of red stuff that doesn't taste too bad will help me keep it a little longer, well, I'm for it. The stuff can be had in almost any health food store. If you're over 50 and draggy, give it a shot. It works wonders for me. I only wish I had known this soon enough to have my poor mother try it. 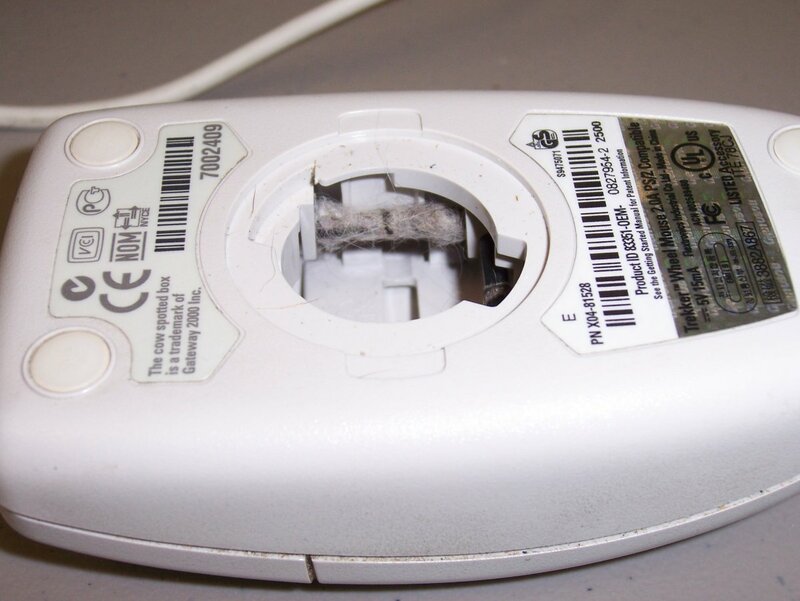 A friend of ours from church asked me to take a look at her PC mouse, which had "gotten a little sticky." I took it home, opened it up, and, well, look for yourself. (129K image.) I've seen (and cleaned) a lot of dirty mice in my time, but this was by far the winner. There are several small warm-blooded animals in her house, so I told her that the best thing to do would be to get one of the new optical mice. Some battles simply don't stay won. Carol and I finally got away (a few days later than we had hoped), put QBit in Camp Bow-Wow, and ran up to Denver to celebratewell, just being alive. (The older you get, the less of an excuse you need.) 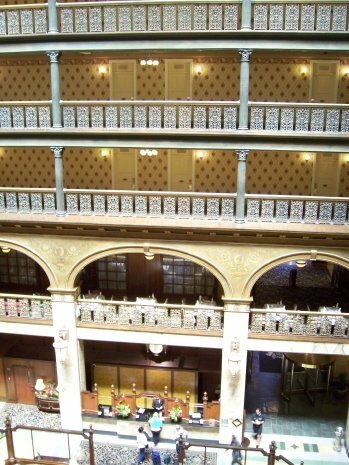 We stayed a night at the Brown Palace, a stately 1890-vintage stone hotel with a six-story atrium and cast-iron stairs, railings, and pillars. We stopped at a couple of places to look at camper vans (including the awesome Camping World at the west fringes of the city) and just did a lot of rubbernecking. For having been here three years now, we've seen relatively little of Colorado, and are planning a number of short trips around the state for the odd idle moments of the summer. We're going to rent a camper van in June and go West on I-70 to Frisco and work our way south amidst the fourteeners to US 50, then east to Colorado 115 and back north and home. Or maybe we'll go somewhere else; we don't know yetand with a camper van, we may not care much. The best part of the trip, though, was simply strolling down the 16th street pedestrian mall, hand in hand, looking in windows and watching the low-key street theater. I allowed myself a little bag of jelly beans (the first in many months) and we stumbled upon a very good clothing shop called Triage in the Writer's Square complex at 16th and Larimer. Carol spotted a dress she liked in the window, and we spent an hour there, Carol trying on dresses while we both chatted with proprietor David Scott. David knows a lot about clothes, and I actually bought a couple pair of casual pants that fit better than anything I've bought in a quite a few years. Carol bought the item in the window (a spectacular watermelon-pink halter dress) and will wear it to my 40th grade school reunion in Chicago in a couple of weeks. We split a brilliant little pizza for lunch at Cafe Colore, again at Writer's Square. It's small and easy to miss, but well worth looking for. Denver has some spectacular architecture, the best of it dating from 1880-1920. Much can be seen just by walking along 16th street from the Capital to LoDo. (Don't miss Tattered Cover Books!) After picking up our car from valet parking, we went into a couple of elegant stone churches: Trinity Methodist and St. John's Episcopal Cathedral, seat of the Colorado Diocese. By then it was heading for suppertime, so we rolled back down I-25 to pick up our puppy and get back to real life. Denver was actually our first choice as a place to move when we decided to leave Arizona, but it was an intimidatingly huge city, and for what I paid for a new, 4,400 square foot custom home here I could have gotten (maybe) a nice 80-year-old bungalow there. Denver is 70 miles north of us, far enough to be away from its traffic and sphere of political influence, but close enough to make day trips and overnighters like this one easy. That's almost ideal. As with most big cities, I like Denver...from a distance. Sony just announced its own entry in the ultra-mobile PC arena, and it's an interesting one. The unit weighs only 1.2 pounds, with a 3.5" 1024 X 600 color display, built-in wireless a/b/g, and a slide-out QWERTY keyboard that may or may be especially useful, except for the thumb-and-peck school of typing. There's 512MB of RAM, 30 GB of hard drive space, and the full version of Windows XP. The resolution and screen size are good enough for reading novels, though any sort of technical illustration will be a problem. Alas, Sony wants $1800 for the little double handful, and that may be a dealbreaker. We'll see. Pete Albrecht sent me a pointer to a nice article about the Bonneville Salt Flats, and the sorts of bizarre vehicles that have vied for land-speed records there since the 1920s. Another article (relayed to me by Harry Helms) in Slate questions the conventional wisdom that losing independent bookstores is a tragedy. The article is worth reading, but the author obviously knows nothing about publishing and very little about how book retailing works internally. The entire book business is broken, seriously broken, and our indie bookstores are the canaries in the mine. I took a hike yesterday through some of the undeveloped land at the foot of Cheyenne Mountain with my X41 in my backpack and its GPS antenna in my pocket. I was trying to determine if the GPS receiver I have can work under tree branches, and amazingly, it did. The X41 recorded a waypoint every five seconds, and I now have a nice track of where I went. I have an older topo map program that doesn't understand waypoints, and need to get one that does. If any of you have ever tried this sort of thing, what mapping software do you plot waypoints on? I'm going to try it on Google Earth's commercial upgrade at some point, but what I really want to do is plot paths on a topo rather than a satellite pic. Ok. I'm not hip. I know. I thought this dopey little game was fun. As I described yesterday, Bruce Schneier made an important point in floating his movie-plot terrorist scenario contest: Terrorist scenarios are a dime a dozen...and yet we haven't been attacked since 9-11. Bruce didn't lay out any detailed guesses as to why, but I think it's a mighty important question. Highly visible security programs like airport screening come off as so completely stupid at times that some people think we don't know what we're doing. On the other hand...maybe that's part of the strategy: Look stupid, then when the mugger acts like you're a pushover, he's on the pavement before he knows what hit him. The public is paying attention to anybody who looks middle-eastern. I'm not saying it's right; I'm saying it's real: The climate of fear since 9-11 has grown into a layer of low-level paranoia covering the entire country. Mugshots of the 9-11 suicide pilots and photos of the "Arab street" in the Middle East throwing tantrums over one thing or another are permanently embedded in the American zeitgeist. Most Americans now see a young Arabic-looking man and think danger! danger! I'd guess it's a lot tougher for people who fit the terrorist "profile" to live unobtrusively, and this makes planning for any kind of difficult operation a lot tougher than it used to be. But that may be minor next to the related issue: Arab-Americans (and American Muslims of any heritage) are keenly aware of the fearful attention they're receiving here, and they know that another terrorist attack from Islamic crackpots would unleash new mass hatred against anything Arabic or Islamic, additional government scrutiny, and nonviolent reprisals or even physical attacks from the public. Some few may be silently cheering the terrorists on, but most are ordinary people who genuinely like the lives they live here. As someone put it, "America is catching." I suspect that moderate American Muslims are watching their own, and if they hear anything even remotely suggesting planning for an attack, a quiet phone call to the FBI can put the pinch on the malefactors. Basically, Islamic terrorists can no longer trust anyone in the US, not even their own coreligionists, and that makes any significant attack a great deal harder to pull off. Neither of these are proof against terrorist activity, obviously, but they definitely raise the bar. The nature of terrorist psychology doesn't prefer small-scale events, especially things (like street shootings or wildfire arson) that happen regularly out of ordinarily criminality and don't carry any kind of gut-gripping symbolic value. The events that carry genuine value for the terrorists have become spectacularly difficult to mount. The question Why haven't the terrorists struck again? may have a simple answer: They tried. We stopped them. Nobody talked about it. Maybe we're just not the suckers we used to be. And maybe we have friends in unlikely places. By now, I think everbody in the world has heard about security guru Bruce Schneier's blog-based contest for "movie plot" terrorist scenarios. Even the New York Times picked up the story. To see the (now very long) list of scenarios, go to Bruce's blog for April 1, 2006. I ran over there the first I heard of it, but found that one of the first scenarios posted was the one I had thought of: A coordinated effort to light wildfires in American drought regions, especially California. Seeing the list of scenarios gave me some chills, and second thoughts: Is this really a good idea? I was slow on the uptake (perhaps, as an SF writer, I can imagine things a little too vividly) but I understand now. Bruce is making a point: There are a gazillion ways to mount a terrorist attack, some of them apparently easy and not all of them suicide missions. However, for all that, it's been four and a half years since 9-11, and Islamic terrorists have not struck again. Bruce's point is one I see no one else making: If they were coming, you'd think they'd have been here by now. I remember having nightmares over Richard A. Clarke's article in The Atlantic for January/February 2005. A fictional retrospective looking back from the year 2011, Clarke thought up a long laundry list of his own terrorist scenarios and laid them out with morbid clarity. We're not as dumb as we're acting. Although the mostly pointless "security theater" one sees in airports (seizing bicycle spoke wrenches from middle-aged Americans, for example) would give the impression that we have no clue about security, the truth is that no one is talking about the security efforts that really matter. That's the way the various government agencies want it. The best preventive measure against terrorism is always good intelligence at the lowest levels. I've had some discussions with a few guys in the FBI, and they were not the plodding dumbasses you generally see in the movies. Once they knew that the threat was out there (which 9-11 put up in lights for all time) I'd wager they got a lot better at sniffing out cluesand keeping the whole program as nearly invisible as possible. They're not as smart/capable/powerful/all-knowing as we've made them out to be. There's something I might call the "bogeyman effect" at play here: Islamic terrorists have become more and more mythic in the American mind, to the point where they've assumed borderline superpowers. Although there's the occasional criminal genius (Bin Laden being one) such creatures are no more effective than their underlings, and getting smart criminal underlings has never been easy. Part of being smart is knowing that getting caught by people as motivated as American security forces will not be pleasant, and whereas Allah may reward them in the afterlife, the "debriefing" down here is gonna hurt. The 9-11 plot wasn't so much brilliant as audaciousand lucky. It doesn't take a criminal genius to know that you can cause considerable damage with large objects full of explosive fuel moving very quickly. The wonder is that they got all the many moving parts to mesh without being detected. I'm pretty sure it only worked because we weren't paying much attention, and I'm even more sure that nothing remotely like it will ever happen again. I'm out of time for today, but there's an additional factor or two that I'll take up tomorrow. Authors need to be in control of their own sales parameters. In print book publishing, financial issues are handed as a given to all but the most outrageously popular authors. Authors have nothing to say about pricing their work, and almost nothing on how much they receive per sale. In the GEN, authors have a choice. They can dicker with referrers over the sales commission, or they can create relationships with referrers willing to use the standard split, whatever it turns out to be. (My guess: 15%-20%.) If authors don't want to deal with any GEN technology at all, they can sign up with an agency/publisher to handle everything and give up additional margin. It's their choice. Middlemen need to prove that they're adding value. In print publishing, middlemen are necessary to some extent because physical objects need managing. In the GEN, middlemen (which as a class I call referrers) help consumers discover ebooks, and develop trust relationships with consumers by endorsing quality titles. Referrers only get paid when they actually provide value to the authors in the form of completed sales. If they endorse bad books, consumers will withdraw their trust and go to another referrer. The GEN needs to be vendor and format neutral. This is why I want to see it as an open source system. My biggest fear is that some gigantic firm will someday field an ebook distribution and reading system that will catch on, and will tie it all up in exclusive publishing contracts and proprietary technology. Apple has come close to doing this with their music downloads, and while it may have taken something Apple's size to bring the Big 5 music labels to heel, publishing is not nearly as monopolistic as popular music (not yet) and if small publishers are seen to be making money through an open system, the big guys may fall into line. The GEN needs to be DRM-agnostic. There is a great deal of hostility to DRM in many quarters, but the decision of whether or not to impose DRM on an ebook must remain with the authors. Some will demand it, and many will not. The key is to let the market decide, with DRM-free books for sale alongside DRMed books. The GEN should not make it impossible to add a DRM module that works smoothly with the Gumball Machine. Those implacably hostile to DRM should see it this way: This is our last and best chance to let the market prove that DRM hurts authors and consumers more than it helps anybodyeven publishers. The GEN needs to be flexible enough to allow different business models to evolve. Publishing does not work precisely the same way for all categories of books. Novels, technical books, and textbooks are not all sold the same way in the print world. The GEN must allow for that sort of difference in the ebook world as well. The non-physical nature of ebooks allows things that are difficult in print publishing. Anthologists, for example, can create "samplers" of material they like (stories, articles, whatever) and the system must be able to be configured so that authors, anthologists, and referrers all make money. Ideas may appear that we just can't anticipate, try as I have. The GEN, if designed correctly, will allow those ideas to take their places at the table and live or die on their own merits. I'm not sure what the next step is; I'm taking notes and sketching up ER diagrams, but this is one I can't just go off and write myself. I need to read up on shopping carts and possibly dissect one. I need to research payment systems. Per-transaction costs are still pretty high: PayPal and Amazon Honor System both demand 2.9% of the transfer value plus thirty cents for each transaction, and in practical terms that sets a minimum price per item of two or three dollars. Other firms may offer better deals. We'll see. In the meantime, I'm open to suggestions. If I create any actual code, (or if someone else wants to chase this one and get it underway) I'll create a project on SourceForge and put it under the GPL. If any idiot can publish a book, most of them will. The biggest challenge we as authors may face is having our books drown in an endless ocean of absolutely useless text. This happens to some extent in conventional print publishing. It happens a lot in the world of print on demand (POD) publishing. As the world of ebook publishing doesn't really exist yet (not the way the others do) it's hard to tell how bad the problem will be once ebooks are a commonplacebut one can guess. In fact, one can also guess that if we don't solve the quality problem going in, there may never actually be an ebook publishing industry. Let's just say that although I've seen some self-published raisins, I have also seen an immense amount of oatmeal. The drive to express oneself is powerful, and as technology makes the whole mechanism of publishing (depending on how you define "publishing") almost trivial, the sheer number of published works will explode until the conventional notion of "being published" will become meaningless. In conventional print publishing, the capital investment in PPBpaper, print, and bindingplus human costs inherent in preparing books, makes publishers careful. Publish a bad book, and you lose your investment. Alas, even well-written, on-point books don't always find markets, and that's why I still haunt the remainder piles. Want to read a fine, fine novel? Go find a copy of Conjuror's Journal, by Frances Shine. As best I can tell, the book sold a few hundred copies and was remaindered. I got it for two bucks on a remainder pile almost 30 years ago, and I consider it one of the best novels in my reading experience. (Your mileage, obviously, will vary.) So imagine how bad the problem will be once the incremental cost of publishing a book falls to near zero. Cash will no longer be any kind of gatekeeper. This is pretty much the case in POD publishing right now. Retailers won't stock POD books, and often won't even special order them. Reviewers for the most part won't look at them. If you don't sell them yourself (and by sell them, I literally mean take orders somewhere and stuff them into bubble envelopes) they won't get sold. Tens of thousands of POD books are published every year, nearly all of them unedited and un-vetted by anybody with raisin-sight. Nobody anywhere in the machinery of conventional publishing wants to have anything to do with them. Almost. Chris Gerrib recently put me on to POD-dy Mouth, and if POD publishing interests you at all, I'd recommend budgeting a few hours and reading the site's entire fifteen-month run. A brave woman is using her blog not only to report news (and explain concepts) relevant to the POD publishing business, but also to fish good books out of the mire and put them up in the spotlight. I don't read conventional fiction much, but people seem to think she has a sense for spotting the raisins. She's currently doing it for free. (She isn't even posting ads!) But suppose her site were a Gumball Newsstand, or perhaps a related, more modest species we might call a Gumball Blog. How she spots the raisins is her problemher secret, if she wants to keep it. But if there were a standard mechanism allowing her readers to order the books she recommends direct from the authors (with a sales commission going back to her) both she and the authors could realize more money on fewer sales than by going through a mostly unnecessary middleman like Amazon. Discovery is key, and trusted recommenders is one way discovery happens. (Think Oprah, heh.) I would probably review more books if there were any money in at at all (there is but a pittance in using Amazon Associates) and I think a lot of my bookish friends would do so too. I would probably specialize in hard SF, or perhaps upbeat popular theology, if that's a category. (Maybe I could make it one.) The point is that if I could gather an audience of people who share my opinion of good books in a given category, I could become a gatekeeper in that category. I wouldn't be the only one, but that's OK. The more people who link to a given author's Gumball Machine, the more money the author would make, and authors who are willing to cut the gatekeepers a few more points would probably have more links and thus more sales. Pulling in the other direction is the necessity of trust: If gatekeepers begin recommending indifferent books just to keep the nickels flowing in, their audiences will shrink as trust evaporates. A free market will eventually find the sweet spot in the middle that keeps both the authors and the gatekeepers solvent by floating genuinely good books to the top of the endless waves of oatmeal. This is where I hope something like the Gumball Ebook Network will lead. If time allows, I'll do a more organized presentation in a white paper, to put the idea out of the patent trolls' reach if nothing else. Sooner or later, somebody will do it, or something like it. Like I said, pieces are all over the place. All we have to do is pull it together. A quick aside before we head up to Denver to decompress a little bit. John Hall asked me how agents and agenting fit into the ebook publishing mechanism I've been describing, and the question is worth a thoughtful answer. I've neved much liked agents. Keith and I always played hardball with them, and the agents we dealt with (who will remain nameless, as much as I'd like to have throttled some of them) were very good at promising us one thing and delivering another. They were also expensive in the extreme, and we told them to go home and get real as often as we dickered with them. And when agents approached me to represent my own work, I showed them my previous book contracts and asked them if they could double my previous advance and get me another 2-3 royalty points. They blanched, and implied that I might not be worth that much in a very competitive market. Translation: That would be real work! I've done well dealing direct with publishers, and haven't had to fork over 15% of the take in perpetuity to an agency that makes two phone calls and hands me an indifferent contract that I have to pass by my lawyer anyway. Besides, when I was trying to sell The Cunning Blood and could really have used an agent, no agent would even talk to me. So...what are agents good for again? I lay that out for the sake of disclosure: I have biases. (Ok, grudges.) But let's look closely at what agents really do, especially in recent years: They allow publishers to outsource some of the book acquisition function and make the authors pay for it. Acquisition is the toughest part of the publishing task that publishers truly control. (Sales is the toughest, but especially for small publishers, it's far more a matter of cash-on-the-line than any exercise of skill.) Acquisitions editors need broad knowledge of the subject matter as well as a thick web of contacts among authors. In a sense, an acquisitions editor is a sales rep who sells competent authors on the idea of publishing with the editor's imprint. They also weed out less competent authors, and develop the skill of weighing an author's abilities as a writer against that author's knowledge of the subject matter. Sometimes a guy who writes like a frog thinks like an Einstein, and you have to kiss a few frogs to find out where the Einsteins are. That's just part of the job. My point is that the difference between an agent and an acquisitions editor is simply who writes the paychecks. A publisher that makes heavy use of agents can eliminate one or more expensive acquisitions jobs, and get the same benefit of having those jobs, but at the authors' expense. Now let's move to the ebook world I'm trying to build here. There's a large problem of quality control that I will take up again later on in this series. Agents have traditionally played part of that role, and something like an agent could play it again. Imagine an agent who sets up an agency that offers authors a package deal: For 10% of your take, we'll provide you with a Gumball Machine for your ebooks on our hosting service, and we'll get you the best links on the best Gumball Newsstands (GNs) that we can, for the most favorable split. An agent with an impressive stable of authors is in a position to get a better deal from GN operators. Remember from previous entries that GN's are paid for referring sales to a Gumball Machine through a system like Amazon Associates, where each sale the Gumball Machine finalizes kicks back a percentage to the originating GN. That percentage is something that GN operators negotiate with authorsor perhaps agents. If a GN operator trusts an agent to deliver authors that sell books, the operator may be willing to take a lower kickback percentage and make it up in volume, having "acquired" a slate of good authors with very little time and personal effort. In short, agents may provide something like the book acquisitions function to harried GN operators, who want to catalog the best authors and books but may not have time to do the winnowing themselves. The big unknown is how much benefit such an agent will really offer to authors, and we won't know until the system is in place and people have some time to try various things. My best guess is that agents won't have a role until the system moves out of the geek space and goes mainstream, and that'll be a few years yet. Next time we'll speak more of quality control, and of reputation. One reason I'm a lot more willing than some to see "self-publishing" tried in the ebook world is that I've seen a fair amount of self-publishing, some of which worked very well. Back when I lived in Scottsdale I belonged to the Arizona Book Publishing Association for almost ten years, was on the board for several, and was president for two. I'd say about 75% of the membership were individuals (sometimes married couples) self-publishing things that they had written. About 5% were conventional book publishers, like Coriolis and later Paraglyph Press. The remaining 20% were publishing services organizations: Cover and layout designers, copy editors, developmental editors, indexers, Web designers, PR services, short-run printers, a couple of agents, and so on. All the little pieces of publishing were represented, and at the monthly meetings a great deal of business was conducted as individuals combined all the little pieces in various ways to make books happen. I watched artists sell covers to authors, authors contract for indexes, and every so often an author contract with a small firm to basically take a manuscriupt, clean it up, lay it out, put a cover on it, and shop for print services. Some authors could do most everything themselves. A few could do nothing but write. (No small number couldn't even do that.) Most fell in the middle somewhere. I watched, fascinated, as a process I might call "recombinant publishing" occurred: People were buying skills they didn't have themselves as their various projects required, and ultimately produced the books they had in mind, with great economy of effort and money. Almost nobody bought anything they didn't need. (Some, admittedly, needed more than they were willing to buy.) The books that came out of this process were sometimes a little odd, and were often highly regional in naturebut I was amazed at how good many of them were. A lot of them, furthermore, appeared to be making at least a little money. One reason for that (surprising) success is that there were a lot of different business models in play. Several members were public speakers who sold their books at their presentations. One couple published books of "cowboy poetry" that they sold at rodeos and in western shops. One guy was a guru in self-hypnosis and sold his books direct through his Web site, drumming up business by tirelessly hanging out on self-hypnosis newsgroups and forums. Only a handful got their books into Borders, but as I learned, there are other places that sell books: Hiking shops, gift shops, antique shops, and more. A surprising number sold their books at tables at home and garden shows, flea markets, and other informal events around the Valley of the Sun. The Arizona self-publishing scene was as successful as it was because it was flexible. The people who created their books adapted to conditions as required, and somehow got their books into print and into the hands of the people who needed them. Contrast this to the infuriating rigidity of the mainstream print book industry, where two chains control the vast majority of all sales, and big presses buy their way into prominent positions in both the media and the retail channel using cash that small presses don't have. My pitch (which I've been fleshing out for the last few entries here) is for a suite of standard tools to make ebook creation, sale, and discovery simple and cheap. The Ebook Gumball Machine and the Ebook Gumball Newsstand are two of them, but there may be a few more. A free, multi-format reader would be fantastic, though unlikely due to the proprietary nature of some of the DRM machinery inherent in some formats. The ideal to which we should aspire is strong standardization and interoperability among all the components. There may not be only a single business model for selling ebooks. There may be a multitude of them, with Gumball Machines and Gumball Newsstands combining in different ways, and creating partnerships with existing Web mechanisms like search engines and print shops capable of creating single printed copies of ebooks at low cost. Some authors may go it alone. Others may team up into peer co-ops, while others (lacking publishing skills or the ability to generate awareness on their own) may partner with Gumball Newsstand operators, who may begin to look a little like traditional publishers. Every variation will be tried. The ones that work will survive. And the more ways there are to create, promote, and sell ebooks, the better off the world will be. More next entry, which may not be tomorrowI'm taking a couple of days off. We woke up this morning with the temp at 33° and an inch of sloppy snow on the ground. QBit, who hasn't had any snow to eat for almost two months, spent the first part of his morning joyously scarfing up all the snow he could hold from the back deck. Each of Carol's daffodils had a little white cap, almost like an Amish woman's. And it's mid-May. Surreal. Some time yesterday I checked my AdSense account and found that I was already over $3 for the day, where I'm often lucky to bank 15 cents. Something was going on. And sure enough, Tim Goss dropped me a note to point out that I had been cited on the Make blog, and then by Cory Doctorow on BoingBoing. I typically get about 600 unique visits per day to my site. Yesterday I hit 2,200, and as of 9 this morning I'm already at 1,600. Although an article I wrote was Slashdotted once, it wasn't hosted on my site. This is as big a spike as duntemann.com has ever seen. And the page in question? My homebrew radio gallery, which I hardly consider the stuff of legend. Crazy worldbut you knew that. Is it possible to buy Windows XP Tablet PC edition in a box? I have an odd concept for a PC using a touchscreen that swings out over your chair on a linkage, like the kind dentists use to point that tooth-centric kleig light down your throat. I even know where to get the touchscreen LCD display, but without Tablet Edition it wouldn't be nearly as effective. Jim Strickland pointed me to an excellent discussion of the confounding economics of mass-market print paperback publishing. The writer, an editor at the romances division of Tor, clearly knows what she's talking about, though I would emphasize more than she does that future book sales figures are guessesoften wild, sometimes fantastical guessesand it's very rare that reality maps neatly onto your spreadsheet plans. I will be continuing my discussion of remaking the ebook publishing business model tomorrow. They acquire books. This sometimes means just taking what an author offers, but often (especially in the computer press) means having book ideas in-house and then finding authors to implement them. I took Assembly Language Step By Step to its publisher, which accepted it basically as offered. On the other hand, Paraglyph Press had the idea for the Degunking series, and we went out and found authors to write Degunking books to our templates. They front a certain amount of money to the author on acceptance of a book concept. The advance against royalties is a sort of "minimum wage" to keep authors solvent. In modern publishing, 90% of books never "earn out" their advances, and so the advance is all the money the author ever gets. Once advances are earned out, publishers pay authors a royalty that is a set percentage of "net revenue," which means money left per book sale after everybody else has taken their cuts. Both the percentage of the net, and the net itself (compared to the cover price of the book) have been shrinking steadily in the last ten or fifteen years. They clean up author text. This involves editing of the text to make it more professional-sounding and readable, and sometimes more aggressive development of the concept behind the book to make it more complete, coherent and on-target. They lay out the book in a readable design, choosing and arranging fonts, icons, chapter and section openers and headings, and things like that. They manufacture the book, and store it in some kind of warehouse. Warehousing is often done (especially for smaller publishers) as part of an agreement with a book distributor. Manufacturing the book involves some tricky analysis to determine how many books should be printed, which is a black art if it is an art at alland not simply guessing with a smiley face painted on it. They market the book to retailers. This is done through a sales force, either on staff (for larger publishers) or under contract, often in connection with distribution services. They promote the book to the general public, or (more often) to reviewers. Less and less of this is being done, especially by smaller publishers. Large publishers allocate their promotional budgets in a very lopsided manner, favoring those books they suspect will become bestsellers. Most books get little promotion of any kind, apart from review copies sent to a standard list of reviewers. This is what we have to rethink and redistribute in the creation of a publishing/business model for ebooks. Let's see what we can do. Numbers 6 and 9 simply go away. We're not grinding up trees anymore. #1 (coming up with a book) is now sole province of the author. Royalties (#3) morph into the ongoing sales mechanism built into the Gumball Machine. (See my entry for May 7, 2006.) This will be helpful: Royalties are typically paid by print publishers only twice a year, but the Gumball Machine generates money every time a book is sold. #7 is an odd case. The retailer function is now split between sales and discovery, where the author handles sales and the Gumball Newsstand handles discovery. Successful Gumball Newsstand operators will probably be selective, and so getting a Newsstand operator to list a book may require some persuasion, or at least an advance copy of the book. This responsibility passes back to the author. #8 (promoting the book the public) also returns to the author. Hanging out in forums, speaking at trade shows and other gatherings, and getting reviews and interviews, all returns to the author. Most authors do this now, to a greater or lesser extent. Successful authors can farm this function out. More on this tomorrow. #4 and (especially) #5 are vital, but they are also eminently outsourceable. Editing, indexing, and layout are very standard and widely distributed skills that can be easily hired from individuals and small shops. I'll have more to say on this tomorrow. The big problem with this redistributed model of ebook publishing is that it hands a great deal of work back to the author, who (if he or she has other responsibilities) may be hard pressed to produce much new material. Like everything else, there are solutions, some of which I'll take up in tomorrow's entry. Reviews. The NYTRB, Oprah, and most special interest publications publish book reviews, and they drive a great many sales. Mention in top blogs does the same thing, if not on quite so large a scale; when Glenn Reynolds mentioned The Cunning Blood on Instanpundit, the book shot up from #300,000+ on Amazon to #2500. Personal recommendation. People recommend books to me all the time, and in most cases the recs are golden. Some of my favorite nonfiction titles (The Little Ice Age, Guns, Germs, and Steel, and The Great Influenza, among others) were all recommended to me by friends. Some recs were in person, some online. "It was there so I bought it." A great many books are sold simply because they're on a bookstore shelf (or a garage sale pile) when people are passing by, not looking so much for a particular book as for a book on a topic of interest, or just a book to kill time in an airport or on the beach. There are other, flukier ways to discover books (browsing other people's stacks is one way I sometimes find otherwise obscure but interesting titles, which I then order online) but the three above are the biggies. So. Can we translate any or all of these discovery mechanisms to a purely digital ebook industry? A more interesting question is, Why hasn't it been done already? In a sense, it has. Look at Amazon. It includes a mechanism for user reviews and user topic classification, for recommendation ("People who bought this title also bought...") and serendipity browsing. The big difference, of course, is that Amazon moves physical products, which need to be received, stored, protected, tracked, packed, and shipped. In the world of physical products, the much-maligned middleman is essential. For ebooks, there's no need for a middleman, and the massive infrastructure behind Amazon's friendly screens just goes away. Ebooks can move directly from author to purchaser. (See yesterday's entry.) What we need, in a sense, is an Amazon that doesn't sell anything, but simply allows people to search for, review, recommend, and discuss ebooks. I call this the Gumball Newsstand. It's a server-side app focused on ebooks. It gets ebook purchasers in touch with the ebooks they want, and then hands off the sale to the authors, each of whom is operating his or her own Ebook Gumball Machine. (See yesterday's entry.) The purchaser buys ebooks from the authors. In my early vision, the Gumball Newsstand has forums, topic browsing, reviews, and a stack rank. It's a Web database app, and because it doesn't have to actually sell things (even bags of bits) it can be a great deal simpler than a massive online retail operation. It also doesn't have to cover every single ebook ever published. My suspicion is that Gumball Newsstands would be fielded by enthusiasts or interest groups to focus on topics: History, cookbooks, romances, SF/Fantasy, mysteries, computer books, and so on. There's no need for one king-of-the-hill site like Amazon, because there's no economy of scale to be gained in putting everything under one roof. The whole damned Gumball Newsstand is just a slice of a hard disk on a server rack somewhere. Because a given Newsstand would be topic-focused, it would require less bandwidth and be less trouble to operate. Newsstands would compete, just as topic portals do today. A Gumball Newsstand operator could exercise any desired level of editorial control over reviews and recommendations. If a Newsstand gains a reputation for having better, more articulate and on-target reviews than its competitors, it will get more traffic and in doing so generate more revenue. Revenue, yes. Even though Gumball Newsstands won't need forklifts or warehouses, there are still some (modest) costs in terms of hosting and bandwidth. Ads are the first and most obvious revenue generator, but authors could also pay Newsstands per sale. Even though the per-sale fee would have to be quite small for ebooks at the $5 level or under, this doesn't even require micropayments per se: The Gumball Machine could include its own affiliates program, like Amazon Associates. Any time any Newsstand (or any third party that understands the protocol) refers a clickthrough that results in a sale, the Gumball Machine adds an agreed-upon sum (15-25 cents?) to the originator's affiliate account, and pays when the total accumulates past some viable threshold where transaction fees (currently 30 cents on PayPal, plus 2.9% of the total) don't consume too much of the take. Somebody could conceivably create a sort of universal Newsstand (Gumballazon?) for ebooks by creating a master index of Gumball Newsstands, listed by topics. Users could rate Newsstands and thus stack-rank them by popularity, which would encourage Newsstand operators to moderate and improve the quality of the reviews and the pertinence of the recommendations. There are bits and pieces of Gumball Newsstands lying on the ground all over the place. Forums, review sites (Epinions, for example) and topic portals are everywhere, and have been for years. Bloggers routinely review books and then pass on the sales to Amazon, with a kickback through Amazon Associates. If a standard ebook Gumball Machine existed, I think it would be no great stretch to funnel sales to tens of thousands of Gumball Machines through a standard Gumball Newsstand. It's pure chicken-and-egg here: Realistically, we need both to have either, and so we haven't pulled the system together yet. I predict it would take about a year for a smallish open-source group to create a system like this in PHP. Anybody interested? There are worse things to do in life than invent a major part of the future, heh. Tomorrow: Outsourcing the (remaining) publishing tasks. David Beers pointed me to a very long but extremely cogent blog entry from Michael Mace on the ebook conundrum. He says a lot of what I've been saying for years now, and if you're interested in the ebook business at all, you will go out and read that entry, plus the others he's written on the topic earlier. Please. Michael is pessimistic on our ability to develop a viable ebook market, largely because of the reader problem. Having a handheld reader people can read for hours on end is important, but we're further along in that regard than Michael seems willing to admit. A Tablet PC convertible (like my X41) is quite comfortable with the right software, and if you're home and sitting in your easy chair, you can plug it into its charger. I do it all the time. In fact, I recently read Colin Wilson's biggest book (A Criminal History of Mankind) in ebook form entirely on the X41. 700 pages! It bothered me not at all, and I think I sat reading on the X41 for as long as I typically do reading a print book. (It took me a number of evenings to go through it.) Tablet Convertibles make good ebook readers, and they're also general purpose laptops. They're still considered premium hardware, though, and mine cost $2400. I think the critical path to a viable ebook market is not the reader (we're almost there) but a way to publish, distribute, and discover ebook content that is owned and controlled by individual authors. What we need is an ebook gumball machine; that is, a server product that accepts payment from end users and dispenses files, while exposing as little technological complexity as possible. Drop in the money, and out pops an ebook. It needs to be that simple. I have been poking at general-purpose shopping carts for years, and I have yet to see one that I would grant the least respect. Besides, the shopping carts you can download or buy are general-purpose shopping carts, most of them unspeakable spit-and-baling-wire lashups in one scripting language or another. We need something highly specific to ebooks, something that can be installed at the Web hosting level by hosting services for their customers, and then configured by anyone with a little PC sense. Programming and Unix-level server-side smarts cannot be required, or nobody will use it but the people who don't need it. It's a perfect opportunity for added value in Web hosting plans. I'm impressed by what GoDaddy has done in the Web hosting business. You can get a single-domain hosting account for $3.59 a month that almost anyone can set up and use. You don't have to screw with Unix permissions and things like that. Server-side apps like calendars, blogs, and photo galleries often come preinstalled, and only require entering values into dialogs for configuration. The author fires up a Web browser and enters username and password for the Gumball Machine configuration page on his/her domain. The author fills in a (largish) dialog, entering the site name, his/her bio and other information, and chooses a standard template (i.e., a skin) for the way the Gumball Machine looks to end users. The author enters PayPal (or other payment service) information, allowing the Gumball Machine to charge users for files delivered. The author enters title, price (which can be "free" if desired) and descriptive info for each ebook he or she will be offering. Cover graphics should be optional, but if cover art exists, it should be selected and uploaded like photos are in server-side photo software like Gallery. If the ebook has been reviewed anywhere, links to those reviews should be entered as well. The author uploads the ebook file in as many different formats as he or she is capable of generating. Formats, alas, are still an issue, and I don't see a standard format beating all others in the near future. That makes it best to cover as many bases as possible with as many formats as possible: PDF, MobyPocket, MSReader, and so on. The author clicks the Publish button for each ebook in turn, and the Gumball Machine immediately makes that ebook available to all comers over the Web. This is not rocket surgery. This doesn't even require "Web 2.0." Look at the Gallery photo server, which I use. It has a very nice user interface, works beautifully, and is free and open source. If Gallery can happen, so can the Ebook Gumball Machine. There are two other pieces that would make a great deal of difference: An authoring system, and a discovery system. Authoring technology is a messy business for several reasons, and I'll return to it at some point. Authors almost by definition understand word processing these days, and any authoring system must piggyback on an author's chosen word processor. But discovery is crucial, and something almost no one talks about with respect to ebooks. I'll address ebook discovery tomorrow (or soon after), in connection with what I call the Gumball Newsstand. Although I reported earlier that Analog had reviewed The Cunning Blood in their June, 2006 print issue, it wasn't until a week or so ago that they had posted the review online. See it here. Wow. Michael Covington sent me yet more evidence that high-end audiophiles have way more money than knowledge of where good audio comes from. Auricaps cost upwards of $10 each for your typical .01 bypass; get up to 5 uF and you're over $100. It must be worth it, though. Auricap leads are (of course) Auric wire, which "is made of soft high purity stranded copper; each strand individually polished for better electron flow." Hey, Mr. Barnum! Another very cool Difference Engine, built fairly closely to Babbage's plans and made with Meccano parts. Thanks to George Ott for the pointer. There's no reason at all why this beast couldn't be run by a steam engine. The Wall Street Journal ran a short article in this morning's issue telling readers how they can buy an entire oak cask of Scots whisky direct from the distillery for about $1500 and put it in their basements, tapping off the booze as required. A cask contains the equivalent of about 200 bottles, egad. So whaddaya do if you decide, partway through the cask, that you're really really tired of whisky? The 'S' key is right next to the 'D' key. So please be more careful than these people were. I got a spam recently with the subject line: "Deerges Baesd On Yuor Kgwonlee" The line's true meaning may be obvious to some (or so the spammers hope) but the unintentional back-channel message does not inspire confidence in their degrees. And hey, wouldn't "Kgwonlee" be a great name for an alien? Here's a perfect example of a bunch of people without enough to do. I like that color, and actually looked at a polo shirt like that at Sears once, only to think, "Cripes, people will think I work at Best Buy." 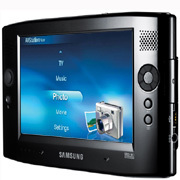 Yesterday's Wall Street Journal published Walter Mossberg's review of Samsung's Q1, the first Ultra Mobile PC (UMPC) to actually hit the streets. In a word (or three): He hated it. The interesting part is that most of what he hated were not implementation flaws, but shortcomings of the platform itself. Note to newcomers: The UMPC is a hardware reference platform ("Origami") developed by Microsoft as a kind of mini-tablet PC, specifically to run XP Tablet Edition and (one would assume) a future tablet version of Vista. The Q1 is quite small: 9" X 5.5" and under an inch thick, with a color display measuring 7" diagonal and 800 X 400 resolution. The Origami spec tells us it will run "all day" on a charge, but Mossberg found that the Q1 conked in two hours. That's barely long enough to watch a short movie on puddle-jumper airplane. Forget Lord of the Rings on the Chicago-to-LA run. Battery life (and price, which he also griped about) are implementation issues. But the worst of it are problems that come of making computers small. I/O (keyboards, displays) have size limitations based on the scale of the human organism. The Q1 has no keyboard, because keyboards that small are excruciating. If a small display is to work, it has to be higher resolution than 800 X 400. Readability is only partly a function of physical size. Resolution plays a key role, especially as physical size goes down. A technology like ClearType might help a little, but there's no fuzziness like small fuzziness. There's no optical drive, and only two USB ports. Another review landed in my inbox this morning. This one has a decent video of the gadget, and will give you a much better feel for its size than photos on a white background. I still don't have a good feel for the "dial keyboard," which is a display overlay in two semicircles, designed for "thumb typing" a la Blackberry. Nor was there any indication of how well the gadget functions as an ebook reader, which is my major personal interest in the UMPC form factor. With higher resolution displays and a better keyboard, the UMPC could be a killer format. Leave the keyboard folded up and it's an ebook/media player. Bring out the keyboard and it's a nanotebook for ordinary office computing. Sooner or later somebody will do the engineering and we'll have it, but it may be a few years yet. Hollywood is circulating a new study (which they sponsored, through LEK Consulting) indicating that the film industry is losing even more money to piracy by far than we understood before. It was in today's Wall Street Journal, and although I don't see much online yet, the story should appear in coming days. The gist of it is that the largest Hollywood studios are claiming that they lost 1.3 billion dollars to movie pirates in 2005, which is more more than any previous estimates. Industry specifics aside, I have a conceptual problem with studies like that: How can we tell how much money we don't make? That a certain amount of money is lost to various kinds of piracy in many industries is clear. However, is that amount in any real sense measurable? There are many well-known fallacies in such calculations, like considering every sale of a pirate copy a lost sale of a legitimate copy. Some percentage of people who buy (or download) pirated copies of something would have purchased legitimate copies. That percentage could well be anywhere from 0 to 100%. The studios lean toward 100% (it makes their losses more staggering) and file sharing devotees lean toward zero, to dodge responsibility. The answer (obviously) is somewhere in the middle. How do we go about finding the answer? It's almost like trying to work out an alternate history. In another universe, where P2P networks don't exist, the studios would have made a different amount of money, but I'll be damned if I can get a grip on how to do the math. Statisticians try to "hold constant" or otherwise account for other variables, but I'm not sure that can be done in situations as complex as this, where so many things come to bear on the collective decision-making of notoriously irrational human beings. I go to fewer movies than I used to both because they cost more, and because fewer movies appear that appeal to me. Is this a broad trend, or is it just me? If you ask a group of people, will they tell the truth? Do they even know the basis of their own decisions? Will they simply tell you what they figure you want to hear? Finally, the biggie: How useful are any such estimates, as guides for taking action? The study in question will doubtless be hauled out by Hollywood to bludgeon Congress into basically shutting down the Internet as we know it. (Of course, dropping hundreds of millions of dollars into politician pockets at the same time makes the bludgeoning go down a lot easier.) Many firms have done the same sort of alternate-history estimates, and driven themselves nuts (and sometimes to bankrupty) trying to guess how things would have gone last year with fewer (or dumber) competitors, a different regulatory climate, a broader (or narrower) product line, lower interest rates, and so on. My own position has hardened in recent years to the following: Such things are unknowable. History runs only once. One can guess, put one's finger to the wind, and perhaps think wishfully, but trying to quantify things that didn't happen is futile, and when done on such a large scale as the studios are doing, can only mean that they're using an imaginary past to construct a future more to their liking. It's time to call BS on all such studies, and insist that planning (and especially legislating) be done on the basis of what can be objectively known. One of the advantages of using a large "tombstone" monitor (which is what I call my two new Samsung LCD displays running in portrait mode) is that vertical space is no longer in such short supply. The two that I now have (an older 213T and a newer 214T) both run at 1200 X 1600, which leaves me enough vertical space to do a lot of interesting things I just couldn't manage before. One is to see both a Delphi form under development and a fair amount of code, all at the same time, without having to punch F12 to get the form to pop up from under the code window. But the one that surprised me most by its usefulness is being able to expand the Windows task bar to three lines. On a busy day I might have most of a dozen apps active (this machine has a lot of memory, and acts like it) but on a single-line task bar, the icons compress horizontally to the point that their text disappears and I can't tell which is which. When I have five or six Word documents open at once, that means I have to remember which taskbar button is for which document, which is annoying. The Samsung 214T is a fantastic display, much faster on refresh than the 213T (though I wouldn't try playing Quake on it) and so razor sharp that working at 1200 X 1600 doesn't bother my eyesI just pulled the monitor a little closer to me and the eyestrain factor went away. Document guy that I am, I really enjoy the tombstone life. If you need a monitor, get yourself one of the new pivoting Samsungs and see if portrait mode doesn't provide you with some unexpected perks as well. As much as I love Delphi, there are things about it that drive me absolutely batshit. I ran across another one today, though it's not for the first time, just the first time in a number of years. In Delphi, there's a very handy library function called StrToDate(StringContainingADate). If you pass the function a date in string form in the parameter, it will vet the date for you and return a TDateTime value equivalent to that date as the function result. Unfortunately, if the string contains nonsense or a malformed date, StrToDate raises an exception. That is exception abuse, pure and simple. This way, if you call the function and it returns False, you don't use the value in Date. Simple. No need for TRY..EXCEPT and all the kafeuthering that Delphi launches into when somebody raises an exception. Handling exceptions while you're working in Delphi's IDE is awkward in a number of ways, so I would prefer to see exceptions used only when they make overwhelming sense. This is not one of those times. A secondary issue regarding date conversion is the use of a predefined global variable called DateSeparator to tell you what character is acceptable as a separator in date strings. I don't like global variables very muchall the books I learned Pascal from spoke of them as one would speak of a tropical diseaseand I don't see why a global variable is the best way to tell a library routine what stupid separator you consider valid. The better way would be to pass a character set variable or literal to the conversion routine, where the set would include any characters you consider valid as separators, for example: ['/','-','.'] That way, you don't have to run the conversion routine three times, after changing that damfool global to each of the permitted separators. I guess I'm just venting here; Delphi is what it is, and since I'm behind on the project already, I don't think I'll be writing a StrToDate function of my own. I look at the code I had to use to make this stuff work and think, Eeee-yuk! I try to make my Pascal as pretty as possible, but in this case, when the standard libraries are that ugly, there's very little to be done other than throw a bag over it and hope nobody else ever has to look at it. Busy today here, but I need to poop a little bit on the increasingly stylish celebration of May Day. Claims that May Day is about the workers is nonsense, of course. May Day is the anointed holiday of violent totalitarian political systems, on both the left and the right fringes of political thought. Back in the 20th Century (a phrase that still rings oddly in my ears) the largest celebrants of May Day were the Stalinist Soviets, the Nazis, and the Communist Chinese. Such swell folks to remember! The red displayed on May Day banners really represents the blood of over 100 million people (most of them workers) who died under the heel of this kind of government. The US did well to separate May Day from Labor Day, but people seem to be forgetting what came out of the early 20th Century May Day movement: massive political murder, the scale of which had never been seen before on Earth. There's no getting around it: If you're celebrating May Day, you're also celebrating Hitler, Stalin, Mao, and Pol Pot.